The Grant County Economic Growth Council invited the director of the Education Workforce Innovation Network (EWIN) to speak about career pathways at its most recent Local Elected Officials dinner. Director Erin Foster said the program aims to encourage early college classes in high schools across Indiana. There are three early college models, Foster said, Traditional, Career and Technical Education and Polytech. The polytech model primarily works to build a technical certificate or industry credential for high schoolers by partnering with local workforce, she said. The curriculum is developed with the local employers and builds skills for workforce success in a hands-on way. “The whole focus of that Ptech model is to bridge education and the local workforce,” she said. EWIN works with the employers to come up with a list of things they’re looking for in employees, now and 10 years from now. The school district can then figure out how those skills and certifications can be worked into the curriculum, through already existing classes and creating new coursework alongside the local employers. Collaborating with local workforce creates a pathway that leads to industry credentials and sometimes an associate’s degree, Foster said. “This gives students an opportunity to learn something they wouldn’t have otherwise, it gives them a credential virtually tuition free and it gives them a future,” Foster said. 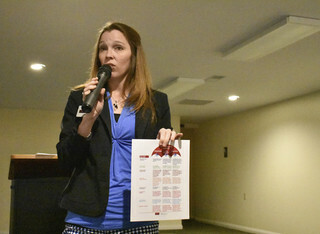 Mississinewa Community Schools Assistant Superintendent Lezlie Winter said they’ve been working on developing early college and career programming, so some of the ideas Foster presented are already in the works on a local level. Mississinewa started pursuing it last year and have worked this year on preparing their application, which has now been submitted and will be reviewed in the 2019-2020 school year, Winter said. Winter said she thinks it’s extremely important to look at what the needs are in the Grant County workforce. She said the schools need to do everything they can to help the students who choose to stay in the area become prepared and able to successfully work and live in Grant County. So far, more than 17 counties, 36 school districts and 156,000 students have been reached by the Polytech early college model, according to Foster. Perry County is one example. Foster explained that Perry Central Schools is small, rural and surrounded by a national forest. They were interested in how this model could impact their community, so they joined EWIN to sit down with local employers Jasper Engines and Transmissions, and Waupaca Foundry. Students within Perry Central Schools have created their own student-led, in-house manufacturing business, Commodore Manufacturing, that partners with the two companies. “If Perry Central can do those kinds of things on a shoestring budget being as rural as they are, anybody who says ‘we can’t do it because of this, this and this,’ those are all things that may be barriers but can be worked around,” Foster said. Executive Director of the Grant County Economic Growth Council Tim Eckerle said they’ve been in ongoing conversations about what such a program might look like in Grant County. He said educational initiatives that help prepare students for a wide variety of potential careers are extremely important. Foster said Georgetown University Center of Education has predicted that only 33 percent of jobs in 2030 will require a four-year degree or more. “So we are missing the boat if we are pushing everybody to a four-year degree when they can easily learn skills alongside the education that will meet the local needs,” she said.